You have a tired piece of furniture, you like it so much, perhaps it has been in the family for a long time or you just care for the environment and don’t want to dispose of it. The solution is to repaint it. It is fun to let the imagination run free when repainting furniture. You are imagining the new piece in a particular corner, you found the right color or pattern you like so much and get equipped with all that is needed to do the paint job, but then you might realize that particular color or pattern will not fit with the décor of your room. Before you get innamorate of a certain design, the first think to do is to ask yourself if color and pattern will go with your room décor. When you are absolutely sure, purchase all the material needed. A couple of times it happened to me. I was totally taken by a certain design that I ended up changing the rest of the room to fit the painted piece. If you are restyling a room based on the new color of your painted furniture, remember that nothing transforms a room better than colors do. Colors in nature work just as you see them, bring them in the room, they will work just as good. A room exposed to South can take bold and rich colors on walls, furniture and accessories. For rooms exposed to North, you might want to use bold colors only in accessories. 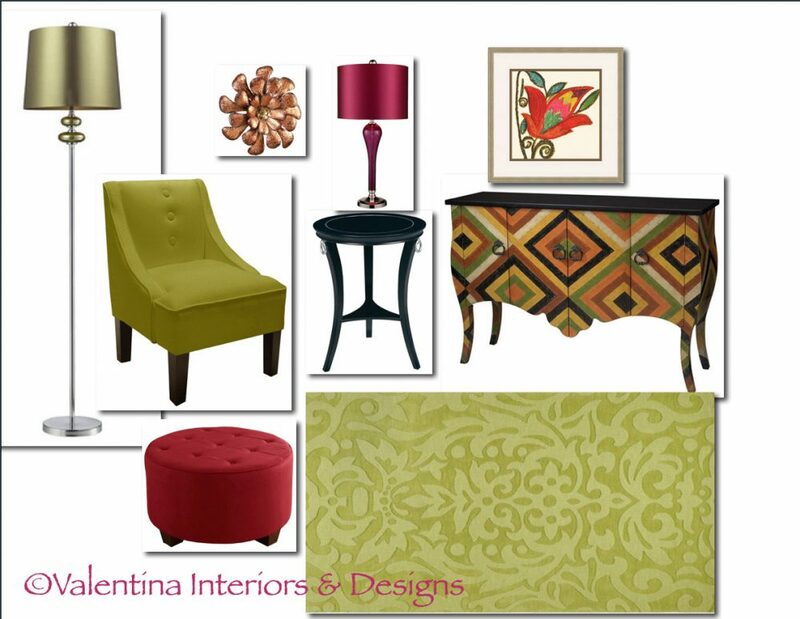 First colors scheme: The green tones came from the green lines of the dresser, by introducing a raspberry color the room become vibrant. Although green is a calming color, it might not be suitable for everyone, especially for those people who have a low value skin tone. 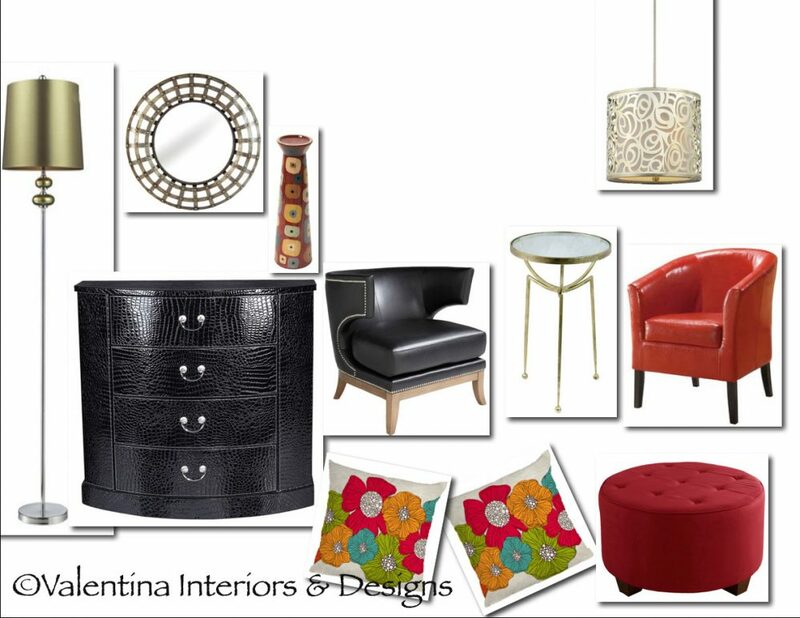 Second colors scheme: the grounding color is black found in the chair legs, coffee table and credenza top. 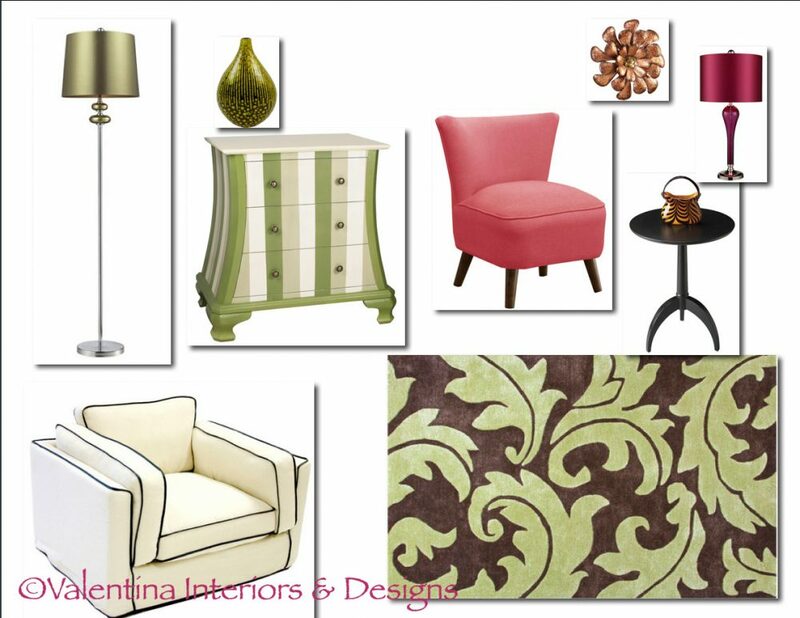 In the next slide, notice how the same piece of furniture looks so different with different colors around. Third color scheme: I picked up the brownish tones from the same credenza with diamond designs, changing the feeling of the room completely. Have you noticed the rug has the same diamond pattern of the credenza? It just happened by chance. 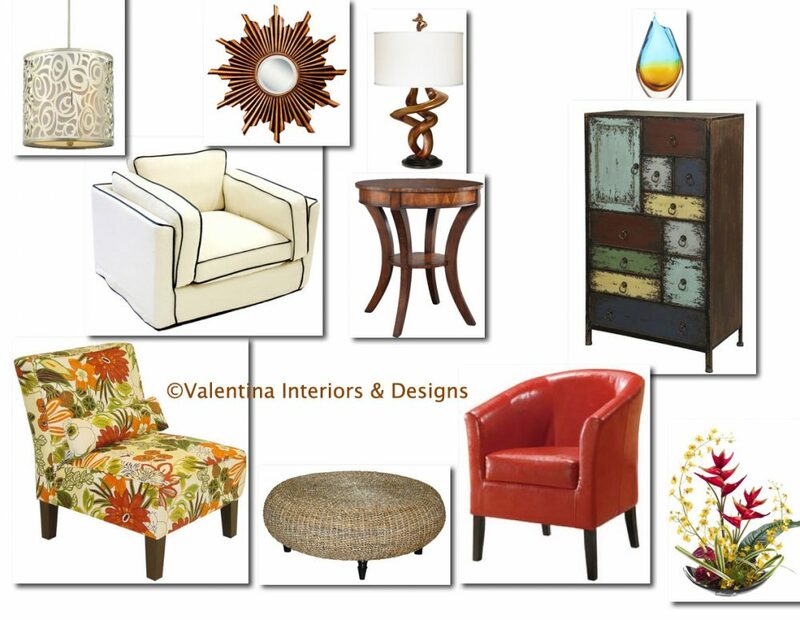 Fourth color scheme: I chose to play with the brown tone of the colorful chest of drawers. 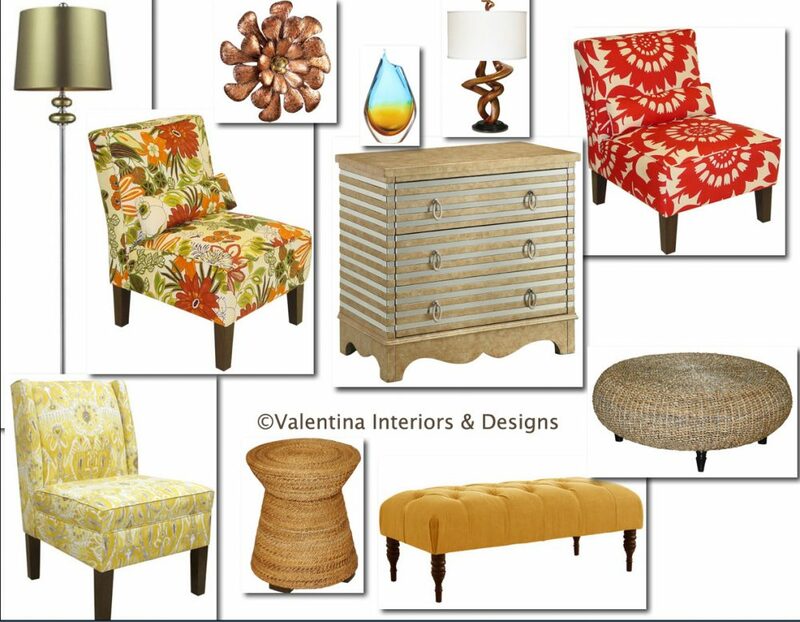 The yellow in the drawers was my inspiration for a yellow tone floral chair. Floral chairs offer many colors to mix and match other chairs in solid colors. Fifth color scheme: painted golden and silver stripes characterize this dresser drawer, to which anything can be matched. 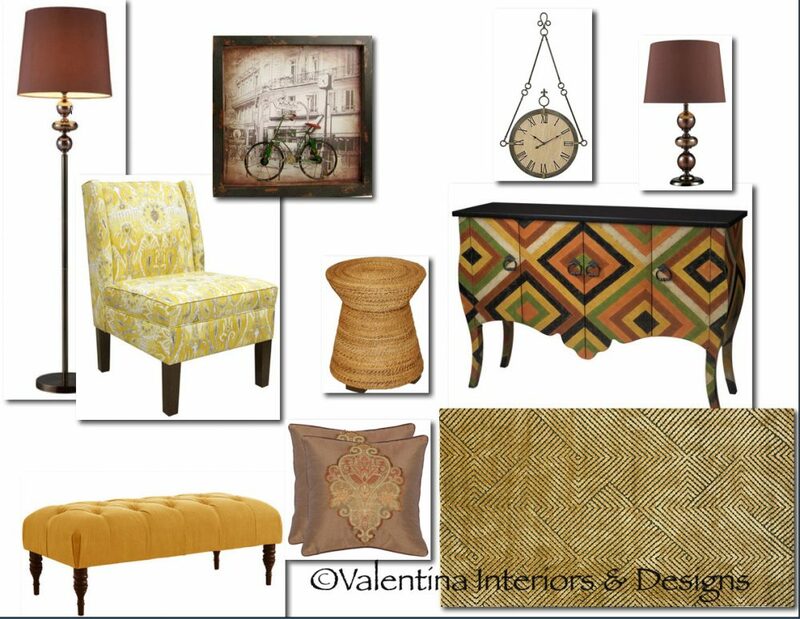 I chose the golden tones, bright, warm colors and added texture with the accessories. The feel is sunny and natural. Sixth color scheme: In alternative to paint a piece of furniture, you might want to consider covering that piece with faux leather, or wallpaper. Color black grounds a room, but also, as a graphic color, lends itself to many color combinations from classical to modern. 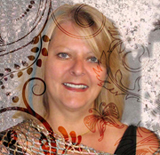 Today’ s wise designer must know how to romance a room and how to dance around client’s budget. Thank you Judy for the visit. I love to paint furniture with so many different faux finishes, but space is limited and cannot always produce all I have in my mind. Gorgeous either way! You have so much style! I love the way you write but it was like nails on a chalkboard for me. LOL I have refinished antique furniture for years in my business and the thought of painting furniture is a huge sin. hehehehe. great post!!!!! Huge sin for me too, very addictive. Thanks for coming over for a visit. if you like antiques at all we could have such a day of fun antiquing!!!! I sure do, I do, love antiques!